The story of the building of the city and the Tower of Babel as found in Gen. xi. 1-9 is briefly as follows: The whole human race spoke one and the same language, and formed one community. This community or clan settled permanently in the land of Shinar, not far from the Euphrates river. Here they built a city and a tower of such materials as a great river-basin would afford and the genius of man could manufacture. Apparently this was done to prevent their scattering abroad and losing their tribal unity, to make a great center about which they might gather, and to obtain for themselves a name. Yhwh came down to investigate the purpose of all this unusual enterprise. The self-confidence and unity of the people were everywhere prominent. Fearful that the accomplishment of this project might embolden them to still more independent movements,Yhwh said, "Let us go down, and there confound their language." Consequently they were scattered abroad upon the face of all the earth; "and they left off to build the city." 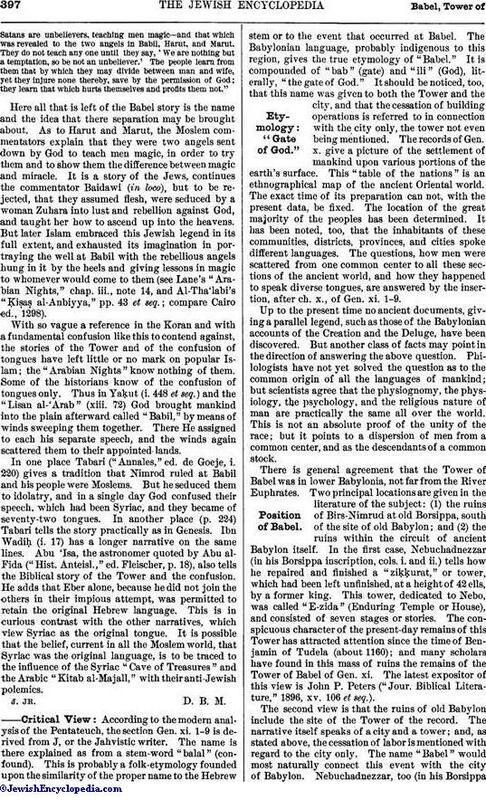 The name of it was therefore called "Babel," because there Yhwh confounded the one language of the earth. The Midrashim give different accounts of the real cause for building the Tower of Babel, and of the intentions of its builders. It was regarded even in the Tannaite tradition as a rebellion against God (Mek., Mishpaṭim, 20, ed. Weiss, p. 107; Gen. R. xxxviii. 9), and the later Midrash records that the builders of the Tower, called , "the generation of secession" in the Jewish sources, said: "He—God—has no right to choose the upper world for Himself, and to leave the lower world to us; therefore we will build us a tower, with an idol on the top holding a sword, so that it may appear as if it intended to war with God" (Gen. R. xxxviii. 7; Tan., ed. Buber, Noaḥ, xxvii. et seq.). The building of the Tower was meant to bid defiance not only to God, but also to Abraham, who exhorted the builders to reverence: therefore the Bible (Gen. xi. 1) speaks of the , "one speech," which is interpreted as signifying speech against "the One," against God, and against His one, only follower (compare Ezek. xxxiii. 24). The passage furthermore mentions that the builders spoke sharp words— —against God, not cited in the Bible, saying that once every 1,656 years—according to Seder 'Olam, 1,656 years elapsed between the Creation and the Flood—heaven tottered so that the water poured down upon the earth, therefore they would support it by columns that there might not be another deluge (Gen. R. l.c. ; Tan. l.c. ; similarly Josephus, "Ant." i. 4, § 2). Some among that sinful generation even wanted to war against God in heaven (Sanh. 109a, and the passage from the Sibylline Books iii. 100, cited by Josephus, l.c.). They were encouraged in this wild undertaking by the fact that arrows which they shot into the sky fell back dripping with blood, so that the people really believed that they could wage war against the inhabitants of the heavens ("Sefer ha-Yashar," Noaḥ, ed. Leghorn, 12b). According to Josephus and Pirḳe R. El. xxiv., it was mainly Nimrod who persuaded his contemporaries to build the Tower, while other rabbinical sources assert, on the contrary, that Nimrod separated from the builders (compare Ginzberg, "Die Haggada bei den Kirchenvätern," pp. 88, 89). (From the Sarajevo Haggadah. )Building of the Tower. Six hundred thousand men ("Sefer ha-Yashar," 12a) were engaged for forty-three years (Book of Jubilees x.) in building the Tower. The Tower had reached such a height that it took a whole year to hoist up necessary building-material to the top; in consequence, materials became so valuable that they cried when a brick fell and broke, while they remained indifferent when a man fell and was killed. They behaved also very heartlessly toward the weak and sick who could not assist to any great extent in the building; they would not even allow a woman in travail to leave the work (Greek Apocalypse of Baruch iii.). God at first permitted the people to continue with their work, waiting to see whether they would not desist from their sinful undertaking, and when they still continued, He endeavored to induce them to repent (Gen. R. l.c. ; Tan. l.c. ; Mek., Beshallaḥ, Shirah, 5), but all in vain. The confounding of the languages—before that they all had spoken Hebrew—then compelled them to give up the work, many also perishing on the occasion; for if any one received stones instead of mortar through the misunderstanding of his fellow-workers, he grew angry and threw the stones upon the one who had given them ("Sefer ha-Yashar," 12b). A part of the builders were changed into apes, evil spirits, demons, and ghosts walking by night (Sanh. l.c. ; Greek Apocalypse of Baruch ii. ), and the rest were scattered over the whole earth. The mighty Tower was blown down by winds (Sibyllines l.c. ; Josephus, l.c. ; Mek., Beshallaḥ, 4, ed. Weiss, 37); according to the opinion of others, one-third of the building was consumed by fire, one-third sank into the earth, and one-third remained standing (Sanh. l.c. ; Gen. R. l.c. 8). In order to convey an idea of the height of the Tower, it is said that to any one who even now stands upon the ruins, tall palmtrees below him appear like grasshoppers. This remnant of the Tower is said to be at Borsippa. Although the generation of the builders of the Tower was much more wicked than that which perished during the Flood, the punishment of the latter was much more severe, because they were robbers, while the former lived in peace with one another, and peace is of such supreme importance that God spares even idolaters so long as they live peaceably (Gen. R. l.c. 7). Compare Languages, Seventy. Ginzberg, Die Haggada bei den Kirchenvätern, pp. 88, 91-94. "But they followed that which the Satans recited against the kingship of Solomon—and Solomon was no unbeliever, but theSatans are unbelievers, teaching men magic—and that which was revealed to the two angels in Babil, Harut, and Marut. They do not teach any one until they say, 'We are nothing but a temptation, so be not an unbeliever.' The people learn from them that by which they may divide between man and wife, yet they injure none thereby, save by the permission of God; they learn that which hurts themselves and profits them not." Here all that is left of the Babel story is the name and the idea that there separation may be brought about. As to Harut and Marut, the Moslem commentators explain that they were two angels sent down by God to teach men magic, in order to try them and to show them the difference between magic and miracle. It is a story of the Jews, continues the commentator Baidawi (in loco), but to be rejected, that they assumed flesh, were seduced by a woman Zuhara into lust and rebellion against God, and taught her how to ascend up into the heavens. 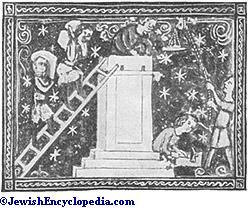 But later Islam embraced this Jewish legend in its full extent, and exhausted its imagination in portraying the well at Babil with the rebellious angels hung in it by the heels and giving lessons in magic to whomever would come to them (see Lane's "Arabian Nights," chap. iii., note 14, and Al-Tha'labi's "Ḳiṣaṣ al-Anbiyya," pp. 43 et seq. ; compare Cairo ed., 1298). With so vague a reference in the Koran and with a fundamental confusion like this to contend against, the stories of the Tower and of the confusion of tongues have left little or no mark on popular Islam; the "Arabian Nights" know nothing of them. Some of the historians know of the confusion of tongues only. Thus in Yaḳut (i. 448 et seq.) and the "Lisan al-'Arab" (xiii. 72) God brought mankind into the plain afterward called "Babil," by means of winds sweeping them together. There He assigned to each his separate speech, and the winds again scattered them to their appointed lands. In one place Tabari ("Annales," ed. de Goeje, i. 220) gives a tradition that Nimrod ruled at Babil and his people were Moslems. But he seduced them to idolatry, and in a single day God confused their speech, which had been Syriac, and they became of seventy-two tongues. In another place (p. 224) Tabari tells the story practically as in Genesis. Ibn Wadiḥ (i. 17) has a longer narrative on the same lines. Abu 'Isa, the astronomer quoted by Abu al-Fida ("Hist. Anteisl.," ed. 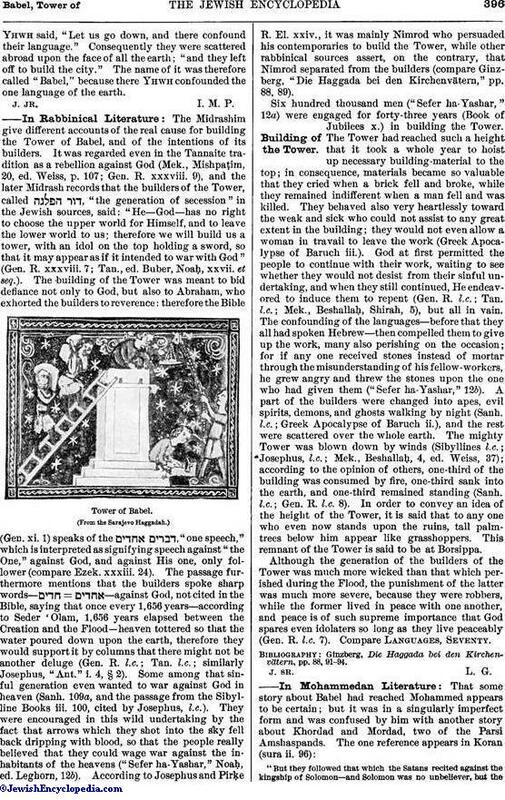 Fleischer, p. 18), also tells the Biblical story of the Tower and the confusion. He adds that Eber alone, because he did not join the others in their impious attempt, was permitted to retain the original Hebrew language. This is in curious contrast with the other narratives, which view Syriac as the original tongue. It is possible that the belief, current in all the Moslem world, that Syriac was the original language, is to be traced to the influence of the Syriac "Cave of Treasures" and the Arabic "Kitab al-Majall," with their anti-Jewish polemics. J. Jr. D. B. M.—Critical View: Etymology: "Gate of God." According to the modern analysis of the Pentateuch, the section Gen. xi. 1-9 is derived from J, or the Jahvistic writer. The name is there explained as from a stem-word "balal" (confound). 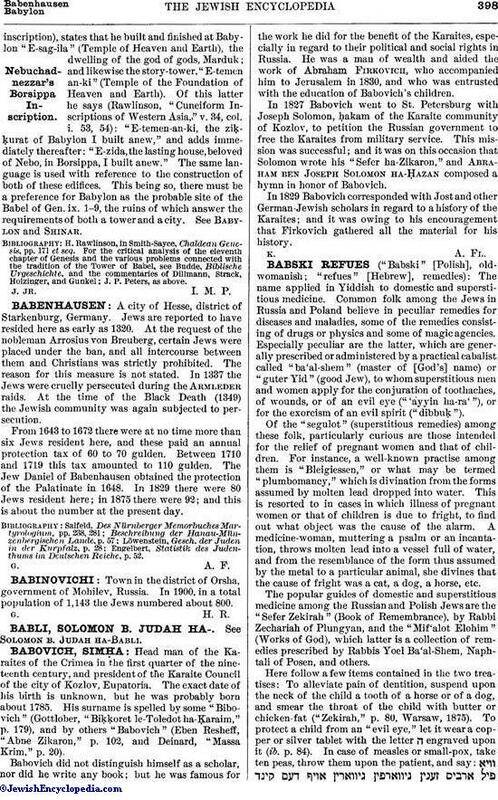 This is probably a folk-etymology founded upon the similarity of the proper name to the Hebrew stem or to the event that occurred at Babel. The Babylonian language, probably indigenous to this region, gives the true etymology of "Babel." It is compounded of "bab" (gate) and "ili" (God), literally, "the gate of God." It should be noticed, too, that this name was given to both the Tower and the city, and that the cessation of building operations is referred to in connection with the city only, the tower not even being mentioned. The records of Gen. x. give a picture of the settlement of mankind upon various portions of the earth's surface. This "table of the nations" is an ethnographical map of the ancient Oriental world. The exact time of its preparation can not, with the present data, be fixed. The location of the great majority of the peoples has been determined. It has been noted, too, that the inhabitants of these communities, districts, provinces, and cities spoke different languages. The questions, how men were scattered from one common center to all these sections of the ancient world, and how they happened to speak diverse tongues, are answered by the insertion, after ch. x., of Gen. xi. 1-9. Up to the present time no ancient documents, giving a parallel legend, such as those of the Babylonian accounts of the Creation and the Deluge, have been discovered. But another class of facts may point in the direction of answering the above question. Philologists have not yet solved the question as to the common origin of all the languages of mankind; but scientists agree that the physiognomy, the physiology, the psychology, and the religious nature of man are practically the same all over the world. This is not an absolute proof of the unity of the race; but it points to a dispersion of men from a common center, and as the descendants of a common stock. There is general agreement that the Tower of Babel was in lower Babylonia, not far from the River Euphrates. Two principal locations are given in the literature of the subject: (1) the ruins of Birs-Nimrud at old Borsippa, south of the site of old Babylon; and (2) the ruins within the circuit of ancient Babylon itself. In the first case, Nebuchadnezzar (in his Borsippa inscription, cols. i. and ii.) tells how he repaired and finished a "ziḳḳurat," or tower, which had been left unfinished, at a height of 42 ells, by a former king. This tower, dedicated to Nebo, was called "E-zida" (Enduring Temple or House), and consisted of seven stages or stories. The conspicuous character of the present-day remains of this Tower has attracted attention since the time of Benjamin of Tudela (about 1160); and many scholars have found in this mass of ruins the remains of the Tower of Babel of Gen. xi. The latest expositor of this view is John P. Peters ("Jour. Biblical Literature," 1896, xv. 106 et seq.). The second view is that the ruins of old Babylon include the site of the Tower of the record. The narrative itself speaks of a city and a tower; and, as stated above, the cessation of labor is mentioned with regard to the city only. 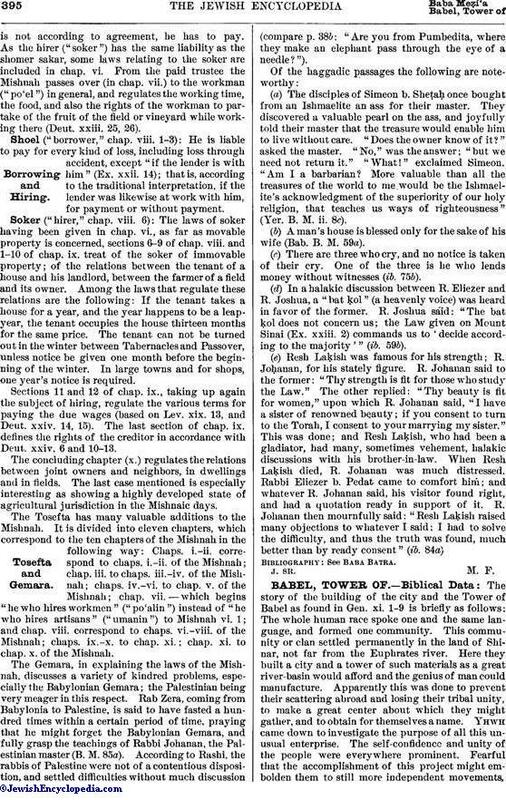 The name "Babel" would most naturally connect this event with the city of Babylon. Nebuchadnezzar, too (in his Borsippainscription), states that he built and finished at Babylon "E-sag-ila" (Temple of Heaven and Earth), the dwelling of the god of gods, Marduk; and likewise the story-tower, "E-temen an-ki" (Temple of the Foundation of Heaven and Earth). Of this latter he says (Rawlinson, "Cuneiform Inscriptions of Western Asia," v. 34, col. i. 53, 54): "E-temen-an-ki, the ziḳḳurat of Babylon I built anew," and adds immediately thereafter: "E-zida, the lasting house, beloved of Nebo, in Borsippa, I built anew." The same language is used with reference to the construction of both of these edifices. This being so, there must be a preference for Babylon as the probable site of the Babel of Gen. ix. 1-9, the ruins of which answer the requirements of both a tower and a city. See Babylon and Shinar. H. Rawlinson, in Smith-Sayce, Chaldean Genesis, pp. 171 et seq. For the critical analysis of the eleventh chapter of Genesis and the various problems connected with the tradition of the Tower of Babel, see Budde, Biblische Urgeschichte, and the commentaries of Dillmann, Strack, Holzinger, and Gunkel; J. P. Peters, as above. J. Jr. I. M. P.